Hey, girl! Welcome to another episode of the Win A Pageant podcast, I’m your coach, Alycia Darby. 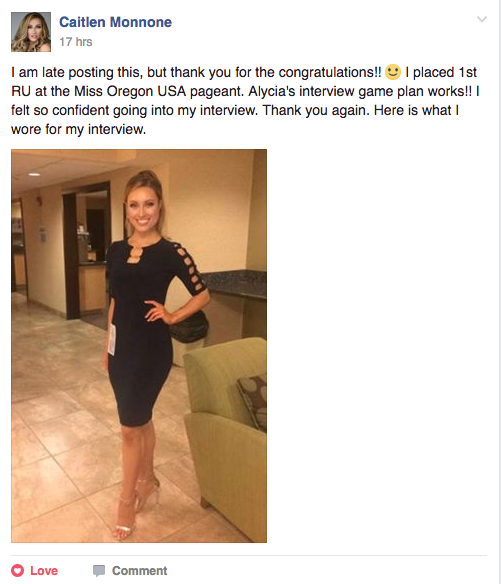 Pageant Interview is the most nerve-wracking part of pageantry. You have to loosen up a bit before your pageant interview so that you can perform in the best way possible. Tricks like imagining the judge’s naked doesn’t work because it takes your mind off of the whole process you need your mind to make this work! 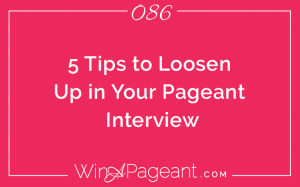 Today, I want to share with you 5 tips to loosen up in your pageant interview AND connect with your judges. Serve, Love, and Give More Than You Take. Anytime we shift our focus to serving rather than being served, to loving rather than being loved, and to giving rather than receiving, we regain a sort of power. It’s like being the junior counselor at summer camp. Abuse the privilege and they’ll send you home. Be the best darn counselor at camp and next year they’ll promote you. Women want to walk out of the interview room feeling like the judges served them the best questions, oo’ed and awe’ed over all their great personality, and gave them 10’s on the way out. Want a 10? Be a 10. Serve them the answers they need. Love their questions as though they are all worthy. Give them your generous approval. Everyone wants to be loved…even the judges. Make them feel like a million bucks and the pressure is off of you. 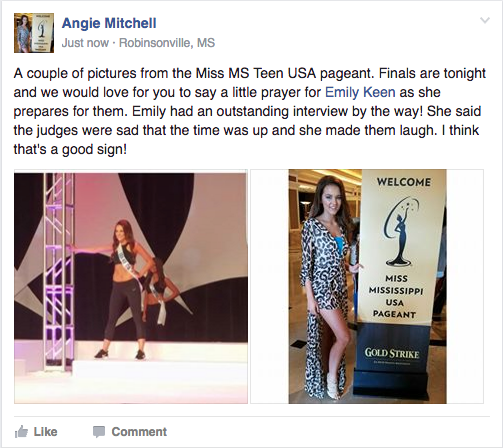 The nature of pageantry makes assumptions run wild. Especially if you don’t have formal pageant training or coaching, it’s easy to assume all sorts of wacky things to try to explain how you did. Usually, these assumptions come from a place of fear. If a judge coughs when you mention you go to church every week with your Grandma, you suddenly believe he’s atheist and you offended him or maybe he doesn’t have a grandma and you offended him… you start second guessing all your values to please someone you don’t even know. Stop that. Don’t assume anything. Just do you. When we start telling ourselves stories about what we think the judges are thinking we throw off the interview and the rest of the competition. If a judge is looking out the window during your whole interview, assume she has 2 lazy eyes that were glued to you the entire time. When you assume the best of people, you react from a place of love and beauty which is always most attractive. Smile More and Laugh at Least Once. You’re the leader. If you are smiling and laughing, they will naturally follow suit. Every girl loves when she makes the judges laugh and by the way, the judges like it too! You don’t have to be a comedian to say something worthy of crackin’ a giggle either. A light giggle can go a long way to break the tension in the room and make everyone more comfortable. It isn’t a race. It’s more like coaxing a deer at a petting zoo to eat from your hand. You can’t overwhelm the situation, but you do have to stick your hand out there with a sweet treat. Everyone has the same amount of time in the interview and if you come off as rushing through the answers, or hurrying out of the room you’ll appear anxious. Instead, before you walk in, take a deep, slow breath. Be responsible for the pace of the questions and prepared to use inflection, thoughtful pauses, and welcomed sidebars to guide them into eating out of your hands. Take your time and when they get there, everyone will settle in. The only way to get super-great at anything is by spending more hours doing that thing. 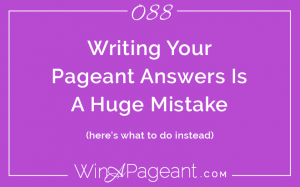 Sure, girls win pageants on their first try, but that doesn’t mean they’re great at the craft. Check on them at nationals and they’ll come up short. 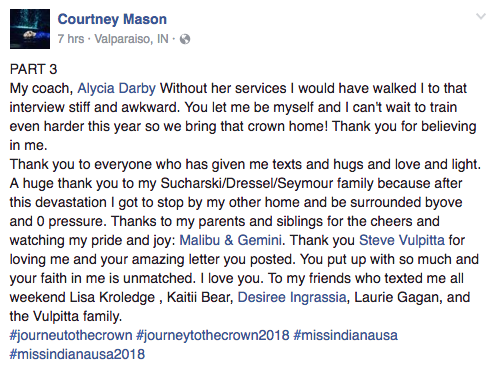 You’ve heard it said (maybe even said it yourself) that being a titleholder is a job. You have to work at it like it’s your job. You have to schedule monthly mock interviews. Put yourself on a media tour. Listen and filter feedback from a variety of people. And Train as though you’re receiving a degree in pageantry. Practicing will help you gain confidence and poise when it’s time for the real deal. That my dear is how you win a pageant! Thanks so much for joining me today. Hey, if you are learning a ton and really benefiting from my podcast training, would you be willing to write a review on iTunes for me? Your review will encourage others to listen and it will help to keep us as the Number #1 Pageant Podcast, which would make me smile from ear to ear! I’d be so grateful to read your kind words on iTunes. If you have 2 minutes, could you go to WinAPageant.com/itunes or search it in the podcast app click on Reviews and write a review and leave a rating. I hope to be worthy of your 5 star rating and delightful review! Thank you, beautiful! I’ll talk to ya next week on Win A Pageant Wednesday!